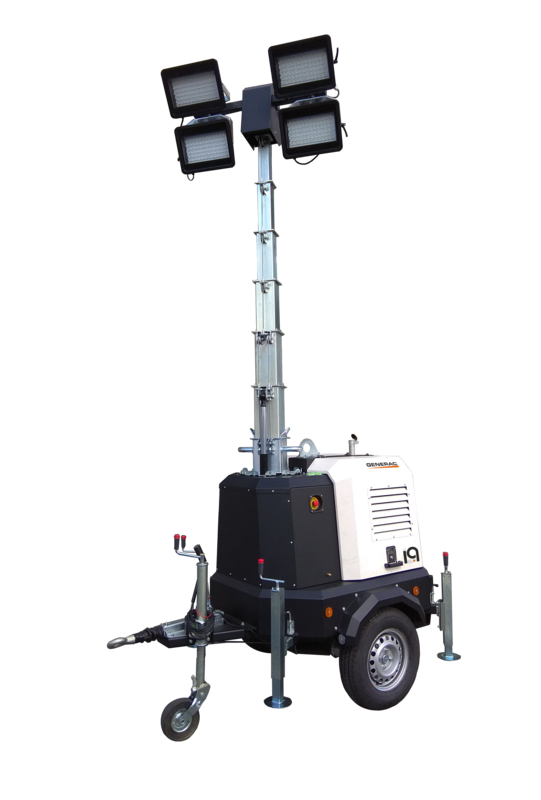 The iQ20 light tower is a mobile lighting tower equipped with a low consumption diesel engine, 4x320W LED floodlights and a digital controller designed by Generac Mobile® for specific use on lighting towers. Thanks to the telemetric system, the iQ20 is the perfect solution for rental companies looking for a simple remote management system of their rental fleet. The iQ20 is equipped with a GTL01 digital controller specifically studied to manage every function of the light tower for the best ease of use. 4x320W high efficiency LED floodlights, powered with 48 Volts. No more high voltages on external cables. Safety as a must! AMOSS KIT – Safe and smart! Even more safety with the iQ20! Thanks to the optional AMOSS Kit you can’t raise the mast without pulling the handbrake, and the mast automatically lowers if the handbrake is unlocked.